Image courtesy of CSULB Theatre Arts. 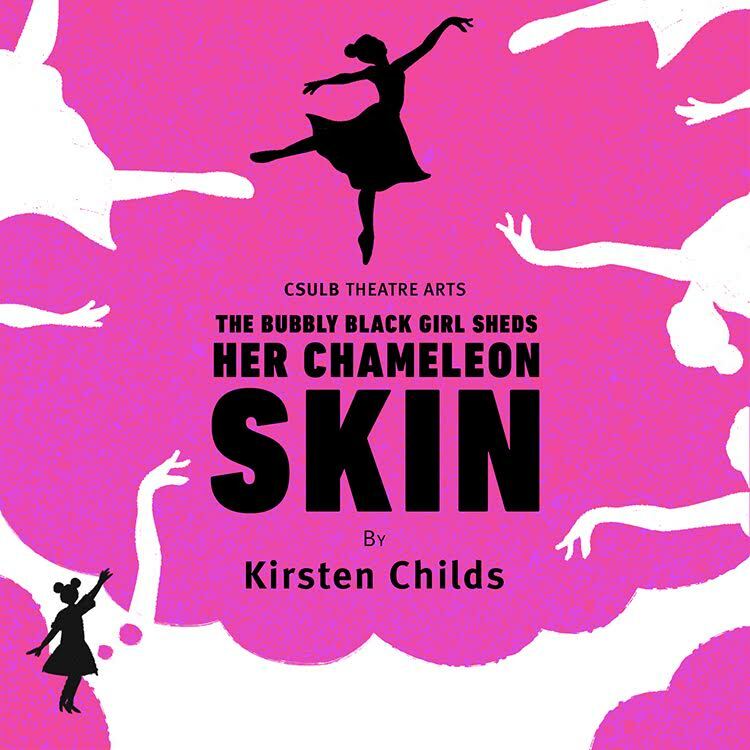 The Bubbly Black Girl Sheds Her Chameleon Skin, a musical presented by Cal State Long Beach (CSULB) Theatre Arts, opened last week and will run through Saturday, March 25. The multifaceted musical follows Viveca, a black woman whose coming-of-age story involves hiding behind a mask of cheerfulness as she searches for success on Broadway and for love. Set from 1960s Los Angeles to present day New York City, Viveca navigates some of the country’s most turbulent times. Photo courtesy of CSULB Theatre Arts by Kip I. Polakoff. “Mixing sugar, spice, and satire, The Bubbly Black Girl… brings Harriet Tubman, flower power hippies, police brutality, and Broadway chorus dancers all to the same stage,” stated the announcement. In the beginning, Vivica adheres to her father’s advice, “Smile for me/ don’t ever let them know you feel the pain; their loss—your gain,” dancing her way through racism, misogyny and more, while at the same time denying her authentic self. Haunted by her white Chitty Chatty doll along the way, Vivica is presented with conflicting standards of beauty throughout her journey, according to the release. After receiving her MFA from the Graduate Musical Theatre Writing Program at NYU’s Tisch School of the Arts, in 2001 Childs became the first black playwright, lyricist and composer to receive the Musical Theatre Award from the Gilman & Gonzalez-Falla Theater Foundation. She continues to produce new work at the Dallas Theater Center, as well as Playwright Horizons, according to the announcement. “Childs’ meditation on blackness and turbulent times—spanning the 1960s into the present—and their impact on an L.A. born-and-raised Black girl named Viveca Stanton, brings the past crashing down in front of and around us,” Williams said in a statement. An award-winning director, playwright, actor, teacher, writer and consultant, Williams has opened plays from the famous Apollo Theatre in New York to the Historical Black College and University’s tour of Emily Mann’s Having Our Say, according to the release. With a PH.D. in Drama and Theatre from UCI and an MFA in Dramatic Writing from NYU’s Tisch School of the Arts, Williams expertly melds critical Black studies with drama theory. Performances will continue for the next two weeks on Wednesdays, Thursdays, Fridays and Saturdays, with a symposium to take place on Friday at 2:00PM. General Admission is $25, with groups of 10 or more starting at $20 per ticket. To purchase tickets and for more information, visit the link here. Performances will take place at University Theatre, on 7th Street and East Campus Drive. CSULB is located at 1250 Bellflower Boulevard.